Lalita is a new NCEP Scholar, currently attendingDarbarHigh School, where she recently started Class 7. NCEP is sponsoring 6 students at this school, including her older brother, Deepak. Originally from Dang, Lalita and her family currently live in a rented home in Kamaladi. She lives with her father Mahabira, mother Samjama, older brother Deepak, and younger sister Laxmi. Neither of her parents are educated, and her father works as a street vendor. Lalita believes that education will lead to more opportunities for herself and her family later in life. Lalita, like Deepak, is a shy but intelligent young lady. Our committed Field Volunteers have been meeting with Lalita, her teachers, and family in order to get to know her better and understand the challenges and opportunities that she faces. We look forward to sharing these updates with you when they come in shortly. 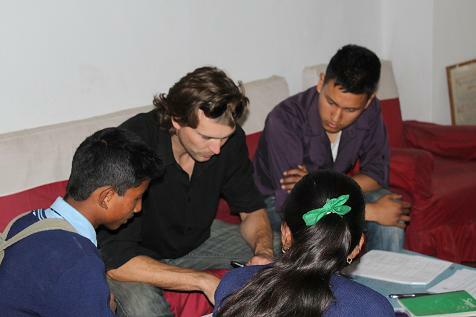 Lalita, her brother Deepak, and mother answer some questions to NCEP Co-Founder Luke and Field Volunteer Tashi for Lalita’s NCEP Scholarship Application Form. Lalita tells Luke and Tashi about her favourite subjects at school. 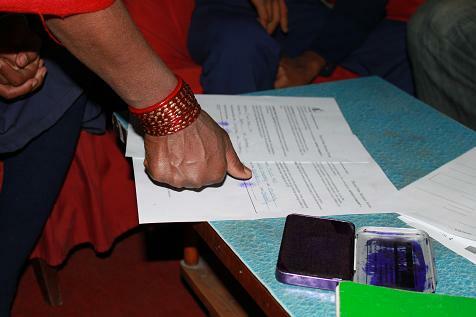 In Nepal, thumbprints are often used instead of signatures on official documents, especially in areas where illiteracy is high. Here, Lalita and Deepak’s mother puts her thumbprint on NCEP’s Photo Consent Form, granting NCEP permission to use their photos online and in print material.